Putnam County Playhouse: "Harvey" Will Close the 52nd Season!!! Harvey by Elwood (Michael McClaine). HARVEY ENDED ITS RUN ON SEPT. 21. 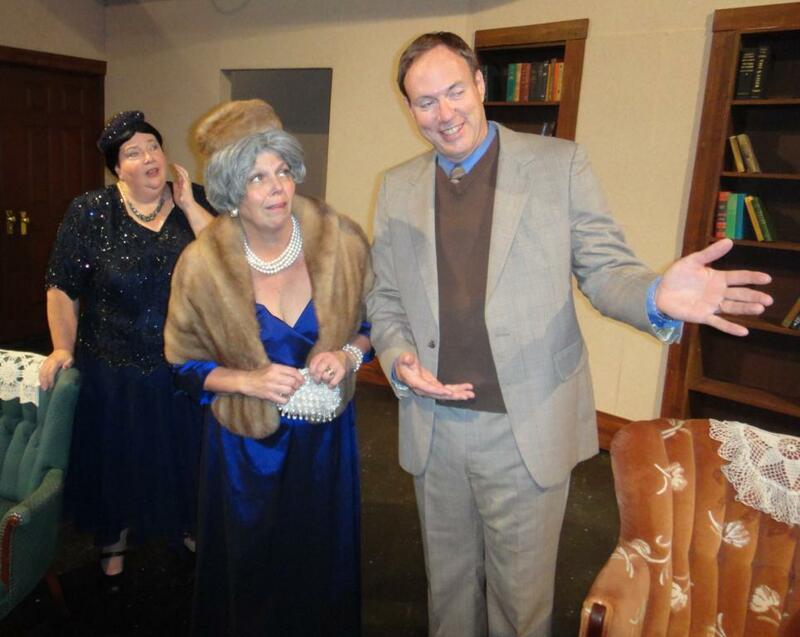 The Putnam County Playhouse 52nd season will close with a production of Harvey by Mary Chase. The comedy won the Pulitzer Prize in its first season on Broadway in 1944. It was made into a popular film starring James Stewart in 1950. Stewart had replaced the original Elwood P. Dowd (Frank Fay) on Broadway during the summers of 1947 and 1948. He also later appeared in a Broadway revival of the play and also starred in a London production. Stewart and Helen Hayes were in a 1972 television production of the show as well. The play is being directed by Jim Rambo. He last appeared onstage in The Curious Savage and directed Don't Drink the Water in 2011. Serving as assistant and technical director is Bryan Schroeder. Schroeder has appeared onstage in Death By Chocolate and also designed the set for Angel Street this season. He is also running the sound board for Harvey. Set design and painting is by Linda Gjesvold who most recently designed the set for The Drowsy Chaperone. Production stage manager is Eva Huang who is working at PCPH for the first time. Michael McClaine has the leading role of Elwood P. Dowd. He believes he has a best friend in a six-foot tall rabbit he has named Harvey. His friend is visible to him, but invisible to everyone else. His sister Veta Louise Simmons (Kathi Elliott, making her PCPH debut) and her daughter Myrtle Mae (Jerica Bean) are both appalled at Elwood's insistance that Harvey share their home. Kathi Elliott plays Veta Louise Simmons. Veta is convinced by family friend Judge Omar Gaffney (Jim Elliott, making his PCPH debut) that Elwood should be put away. She chooses the sanitarium run by Dr. Chumley (Don Collins), who has his own problems with his assistant Dr. Sanderson (Dustin Bond) and his nurse Miss Kelly (Sarah Bond). Collins has appeared in many productions including The Sunshine Boys, Barefoot in the Park, and Don't Drink the Water. The Bonds most recently appeared in The Drowsy Chaperone. Playing other characters in the play are Karen Temple, David Roberts, Sandi Rossok, Cheyanne Elliott (PCPH debut), and Alan Zerkel (PCPH debut). Shelly McFadden and Marilyn Burdsall are heard as featured performers at a party in the first scene. Temple has appeared in many productions including Annie, I Remember Mama, and Pippin. Roberts appeared earlier this season in The Drowsy Chaperone. Rossok appeared in The Curious Savage and was assistant director for Angel Street earlier this season. Also working on the production side of Harvey are Brenda McClaine, Diana Van Middlesworth, and Ruth Poor. Harvey is being sponsored by Duke Energy.